The Luminous Lagoon is said to be the largest and most brilliant of four in the world, a fact that continually attracts and awes visitors and scientists from around the world. 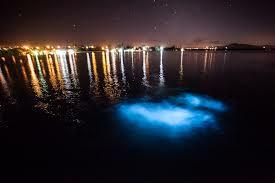 If they're disturbed, at night, millions of microscopic organisms called dinoflagellates, cause the lagoon to sparkle producing an eerie glow. If you are looking for a truly unique experience, at twilight, get aboard a boat in the luminous lagoon at Glistening Waters, sail out and be stunned as nature literally comes ‘alive.’ As the boat moves, the path it takes glows as bright as a firefly. Imagine seeing lighted outlines of fish as they move. The highlight of the 45-minute tour is the point where you are allowed to jump out and swim, your body surrounded by the luminous green glow. Our tour customer support specialists are ready to assist you Mon-Sun, please contact us or call to speak to a tour specialist.